If you have not attended the session, please read the general introduction to the ​iMinds w-iLab.t testbed before starting this tutorial. In this tutorial, we will show you how to set up one wireless access point and connect with 1 client. The access point will start an iPerf server instance, after which we will run an iPerf client instance on the second node. By using the correct IP addresses, we make sure that the iPerf traffic stream is routed over the wireless interfaces. In this tutorial, we will use a fixed wireless node for setting up the access point. The client will be running on a mobile node. After successfully setting up the iPerf stream, we will demonstrate how the mobile nodes can be configured to drive a pre-determined path. In a second part of the tutorial, we will demonstrate how to use OMF/OML & Labwiki to run wireless experiment on the w-iLab.t testbed, including mobile nodes. 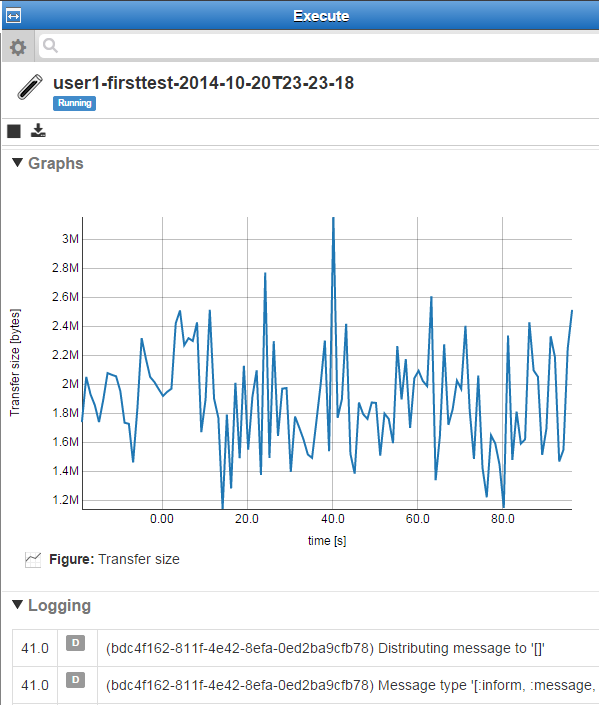 Using the graph plotting capabilities of Labwiki, you will be able to visualise the iPerf throughput. Login to the ​GENI portal, click on Use GENI and browse down to My Projects. Now click Join a Project and type ipv6 in the search box. Click the Join button next to the ipv6project, browse down and click Send join request. This step is needed to be able to connect to the iMinds testbed nodes, as they are fully IPv6 enabled. Login to the ​GENI portal and browse to the ​profile page. Now go to the ​ssl tab and click on Download your SSL certificate and key. 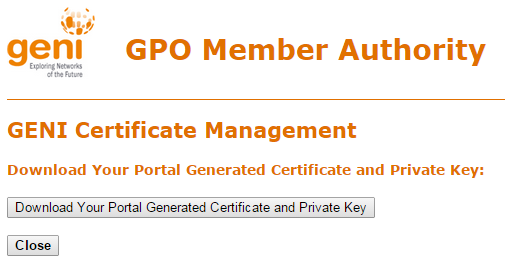 Click Download Your Portal Generated Certificate and Private Key on the next page. Store the resulting .pem-file somewhere on your hard drive, you will need it in the next steps. 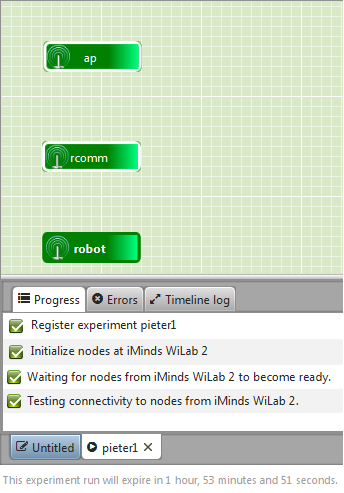 This step is needed to be able to reserve nodes at the iMinds w-iLab.t testbed and access the Robot Control Dashboard. Fire up jFed by browsing to the ​GENI portal and click on Use GENI. Browse down to the tools and click jFed. If all goes well, you should be prompted to provide your User certificate and Password. Browse to the location where you stored the .pem-file (see previous step), provide your password and click Login. Once jFed is started, click on Preferences, select User details and save your login as PKCS12. Store the resulting .p12-file somewhere on your hard drive. Windows users(Chrome): Browse to the location where you stored the .p12-file and double-click it. Follow the instructions on screen to add your credentials to the certificate store. Linux/MAC OSX users: Import your .p12 file in the certificate store of your browser. Browse to the ​w-iLab.t reservation page. If the previous step was successful, you should now be prompted to select your certificate. Once the page has loaded, please verify that the last part of the User URN matches your own user name. Fire up jFed by browsing to the ​GENI portal, go down to the tools and select jFed. If all goes well, you should be prompted to provide your User certificate and Password. Browse to the location where you stored the .pem-file (see previous steps), provide your password and click 'Login'. If this is the first time you are using jFed to activate nodes in the iMinds w-iLab.t testbed, you have to enable the proxy first. Click on Preferences, select the Proxy tab and click Run Proxy Test. Select the Always option for both Proxy for jFed and Proxy for SSH connections. Click Run to start your slice (Green arrow on the top left) and fill in a unique name for your slice. When all nodes turn green, your experiment is succesfully activated. For this tutorial, leave the txpower set to default (17 or 20dBm) for the first experiment runs. If the effect of moving the mobile node is too limited, you can try lowering the txpower. Note that each antenna at the w-iLab.t is equipped with a 10dB attenuator (so 20dB attenuation per link). Once everything works fine, you can start driving the mobile node and check the impact on the iPerf throutput. Note that you will lose your SSH connection to the robot when it is no longer in its docking station. 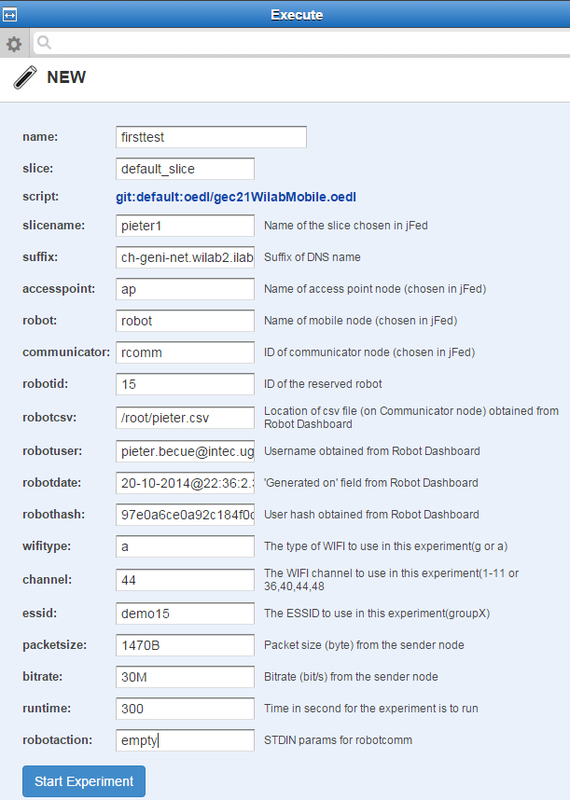 The Robot Dashboard can be accessed at ​robotcontrol.wilab2.ilabt.iminds.be. Be sure to use a recent Chrome or Safari browser. If you imported your p12 certificate into your browser, you can login by clicking the red key (top right of the dashboard). Select the Fed4FIRE SFA tab and click Login. If you now hover over the key (hopefully not red anymore), it should show your login name. You will only be able to move robots which are reserved by you. 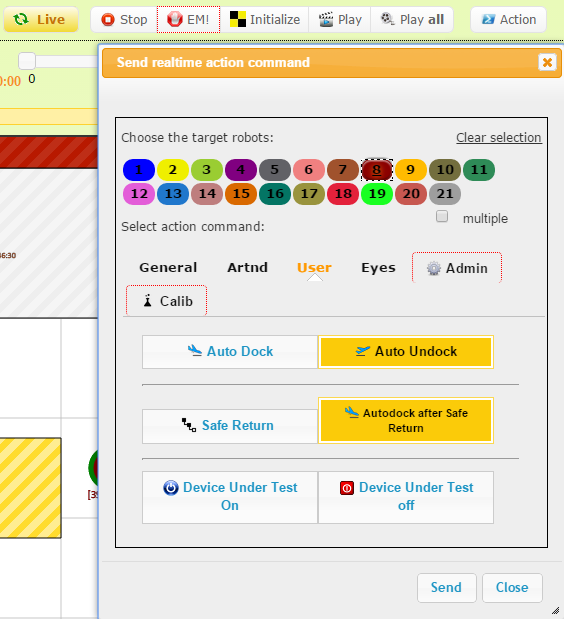 Now start drawing a path for your robot by selecting the robot ID on the top left of the Robot Dashboard. On the top left, you can also choose between straight paths and bezier curves. Always start your path by clicking on its Safe zone (the circle below the charging station with the ID of the robot in it) and dragging towards a location of your choice. Be sure that you don't cross any obstacles (marked in yellow or blue). If you do cross obstacles, the Robot Dashboard will tell you (and you will not be allowed to start driving that path). 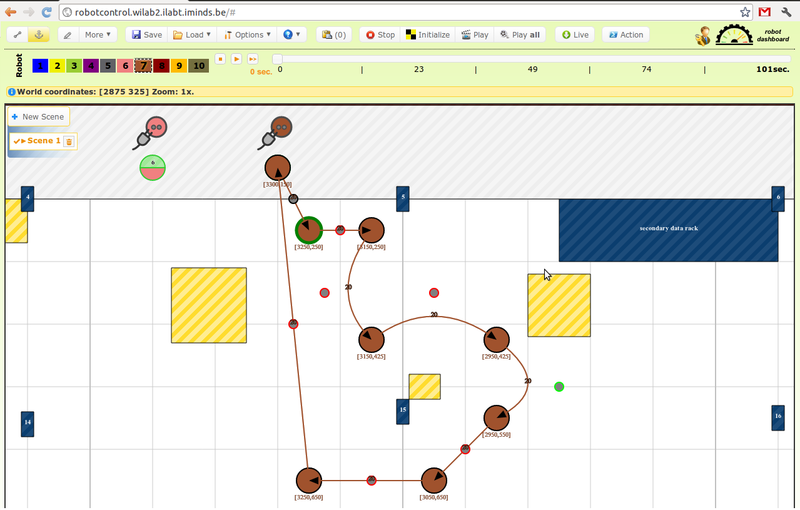 Add some more segments to your path and make sure that your robots returns somewhere near its safe zone (circle with ID of the robot) at the end of your scenario. Click on Initialize to taxi the robots to their starting position (check the top right of the robot dashboard for errors). If no errors occured, hit the Play button. 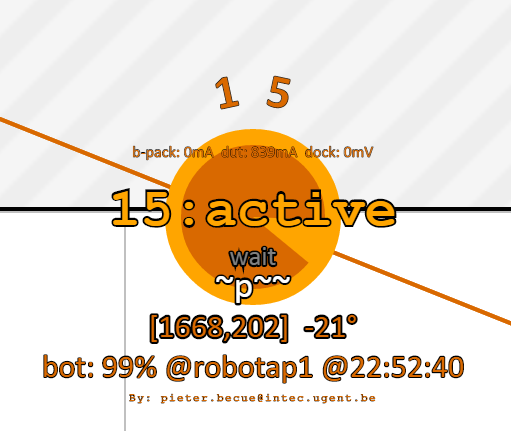 You should now see the status of your robot changing to Active and see it moving around. At the end of your experiment, click on Actions again, go to the User tab, select Auto dock and hit Send to park the robot in its docking station. If the robot is too far away from its docking station, you should use the Safe Return option, which will automatically search for the shortest path towards its docking station. 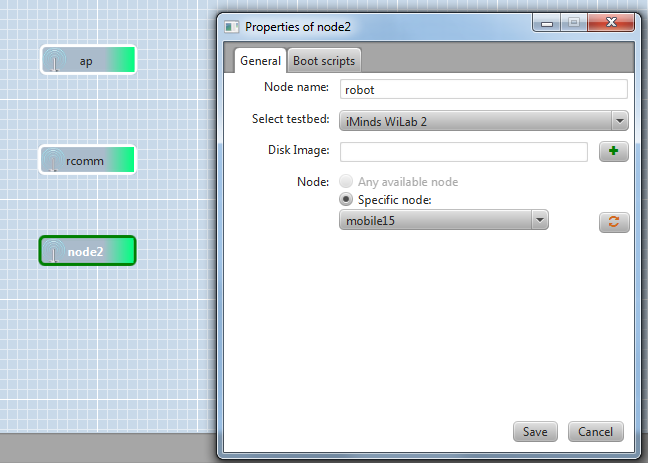 Go to ​http://robotcontrol.wilab2.ilabt.iminds.be and start drawing a scenario for your mobile node. If you are done, click the Save button and copy the list of coordinates. SSH to your robot communicator (Rcomm) node, create a file in the root directory and paste the csv coordinates in the file. Go to ​http://labwiki.test.atlantis.ugent.be:4000, click the prepare text field and type gec21Wilab. You should see a drop down list with some files. Select the gec21WilabMobile.oedl file. Since this version of labwiki only has one user account at the moment, you should copy the contents of this experiment file and create a file with your group number (or name) in the file name. Click CTRL-A, followed by CTRL-C and then click the wheel icon. Choose a name for your file (without the .oedl extension), select OEDL and click Create. 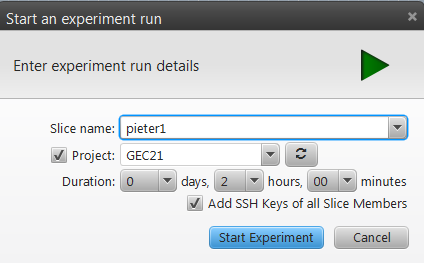 Now paste (CTRL-V) the contents of the experiment in the field below and click the Save button. The presentation at the beginning of the session should have given enough explanation to understand this experiment description file. 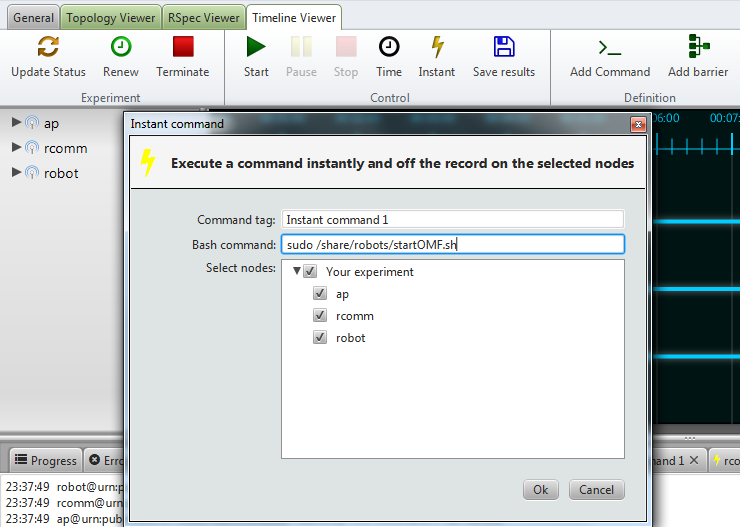 Be sure to issue the following command (on all 3 nodes(ap,rcomm,robot)) before running any labwiki experiment. 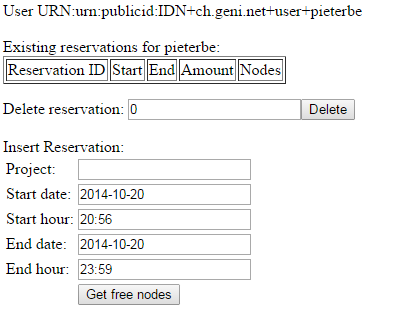 This will start the OMF6 resource controller on your nodes, so labwiki can control them. Drag & drop the page-icon (with the crayon) over to the Execute field. Now change the properties with as value REPLACE ME so they reflect your setup. It is very important that the names of your slice and your nodes are exact matches to the names you chose in jFed. Be sure you type them in lower case !! If you want to access the raw measurement data of your experiment, go to the web page of the OML server: ​http://labwikioml.test.atlantis.ugent.be/phppgadmin. 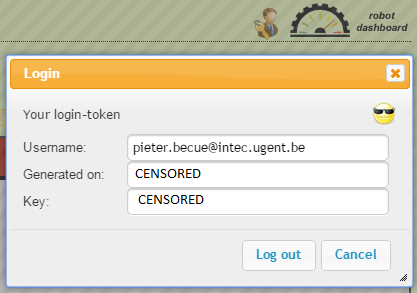 You can login with geni/geni. The iperf_transfer table contains the values reported by the iPerf server (every second, the transfer size is logged in bytes). The robotcommunicator_RobotLocation table contains the exact location (and orientation) of the robot during the course of your experiment. You can use the timestamp (oml_ts_server) of the values to match a robot location to an iPerf measurement.